I never make t-shirts. Never. My mind is always thinking they are too simple to make. I like complexity and challenge. I’ll just buy them instead, I tell myself. Except, I am finding good quality t-shirts harder and harder to find. These days they all seem to be made from extremely thin material that pills after several washes. 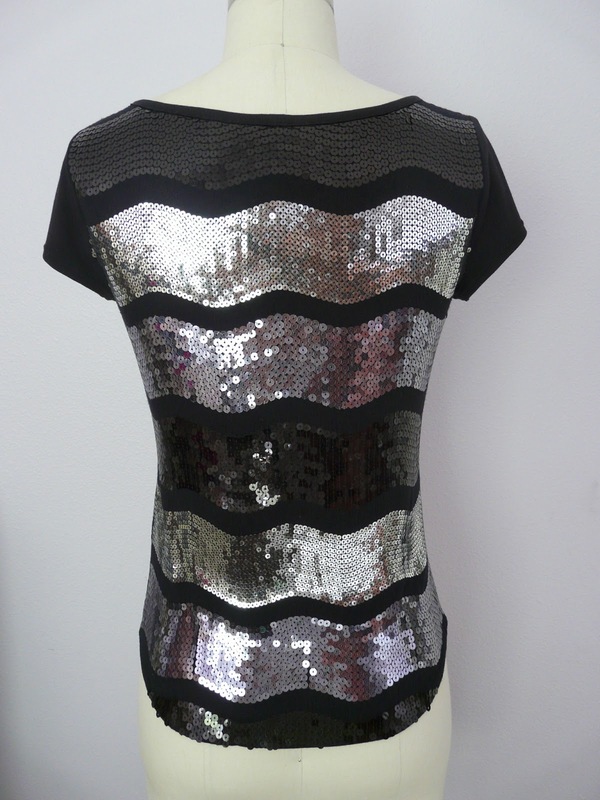 The body is made from a sequined wave cotton jersey from Mood fabrics. I ordered a swatch of it several months ago and fell in love. 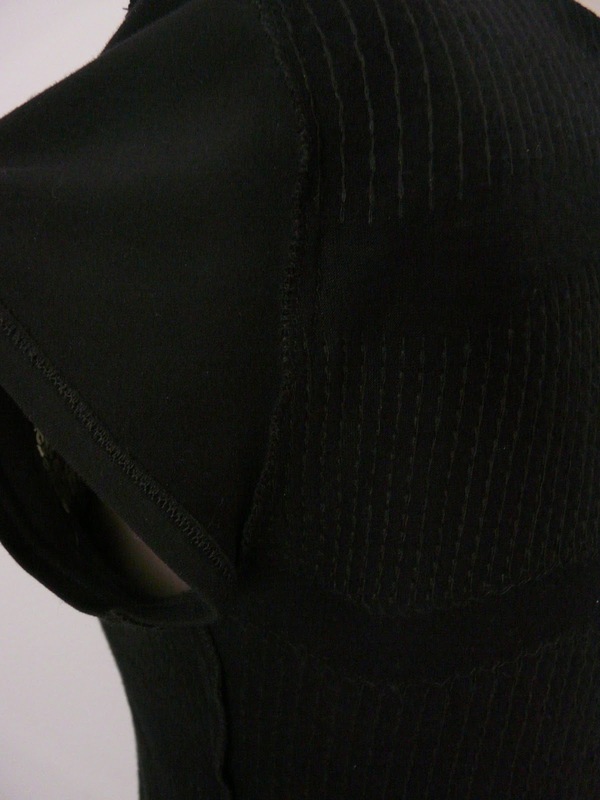 The sequins are sewn on with nylon thread on top and cotton thread underneath, which provides lots of strength to keep the sequins on and protects your skin from any scratchiness of the nylon. I washed and dried it before starting this project and only noticed one sequin come off (which was probably on an edge somewhere). The sleeves and neck binding are a bamboo knit, also from Mood fabrics, left over from this project last October. Several patterns were pieced together for this project – Vogue 8536 for the body and McCall’s 6559 for the neckline – both of which I have made previously. I cut the sleeves way back for more of a modern look and made the hem a high-low. After I got everything traced out to my satisfaction I made a muslin to test the fit. A few adjustments later and I was ready to cut into my fabric. If you are going to tackle a project with sequins, be prepared to get them EVERY WHERE! At first I just sewed the shoulder seams with the sequins attached, but they were all caught in the seam and there was no way to iron. 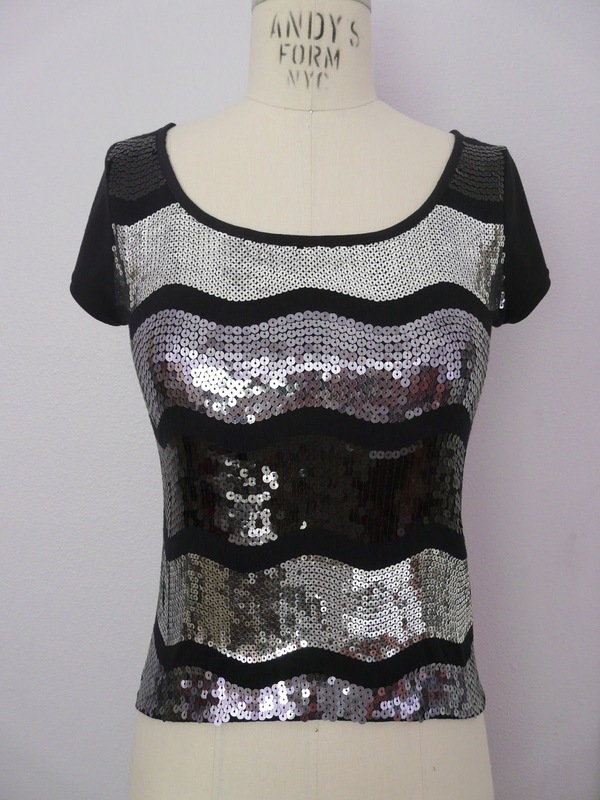 Plus, it would have been super uncomfortable to wear a top with sequins scratching my skin at all the seamlines. I tried cutting them out of the seam after it was stitched but realized that wasn’t going to work either. No, I had to remove all the sequins in the way of any seam before I stitched it. I started season 1 of “Alias” with my fabric and seam ripper, and am now on episode 9. I’ll let you do the math. For the sleeves I used my twin needle at the hemline. I stitched the neck binding doubled to the inside of the garment, then graded the seams and flipped it to the outside. This way any sequins on the edge got encased in the binding and I got a neat finish to the neckline. Also, I decided to try sewing the sleeves in flat – like they do in RTW (ready to wear) – and stitched a tiny bit of topstitching to keep the underarm seam flat against the sleeve. The hemline involved more removal of sequins. I decided I didn’t want to try using a twin needle and topstitching, so I stitched the hem entirely by hand with a whip-stitch. You can also see the cotton threads along the inside of this fabric. I used my overlocking foot to finish all the seamlines. My goal was to make this top casual enough to throw on with a pair of capris or jeans, and I think I was successful. This simple t-shirt turned out to be quite a bit of work! I felt like one of those ladies in couture design houses, all dressed in white, with their needle and thread in hand. Editor’s note: But look at the payoff!